Self-Harm is used as a method of self-expression, intentionally hurting one’s self can express difficult emotions within. It is also used as a way to release pent up emotions of anger and stress. It may be seen as the only way to cope, it may seem like the only outlet. Afterward the person may feel better; the hurting has distracted away those ‘hurts in my heart’. But inevitably the painful feelings will return and the person will have to hurt themselves again. 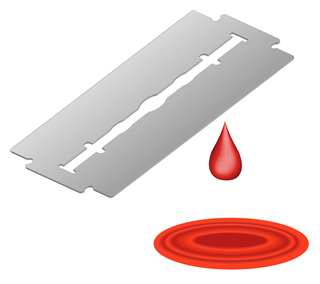 Teens who cut themselves are rarely trying to kill themselves. But this should not be taken for granted. The act of cutting or scratching is most likely, a coping mechanism for dealing with strong emotions, intense pressure or the stresses of social interaction in places like school and with the significant relationships in life, parents and / or a partner. This happens because either he or she hasn't developed effective ways to cope or existing coping skills may be overpowered by intense emotions. Being overwhelmed by particularly troubling feelings is released by cutting. Unfortunately, any relief will be temporary. The person will already know that whatever troubles triggered them to cut will still remain; and will only be briefly masked. Recent research has shown that deliberate self-harm in older people can be frequently regarded as a failed suicide attempts.